Old cast metal covered wagon ashtray toothpick? Old heavy cast metal conestoga wagon. 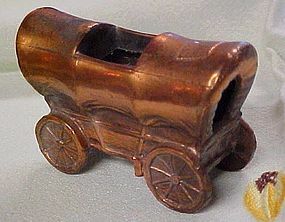 Both ends are open so you can rest your cigarette and the smoke would come through the hole in the top and look like the wagon was on fire. Measures 3" talland is about 4" long. Good condition, copper coloring. Could be used as a toothpick holder too.